Police violence: How to subdue a knife-wielding man without lethal force. You won’t believe what happened next: They didn’t shoot him! 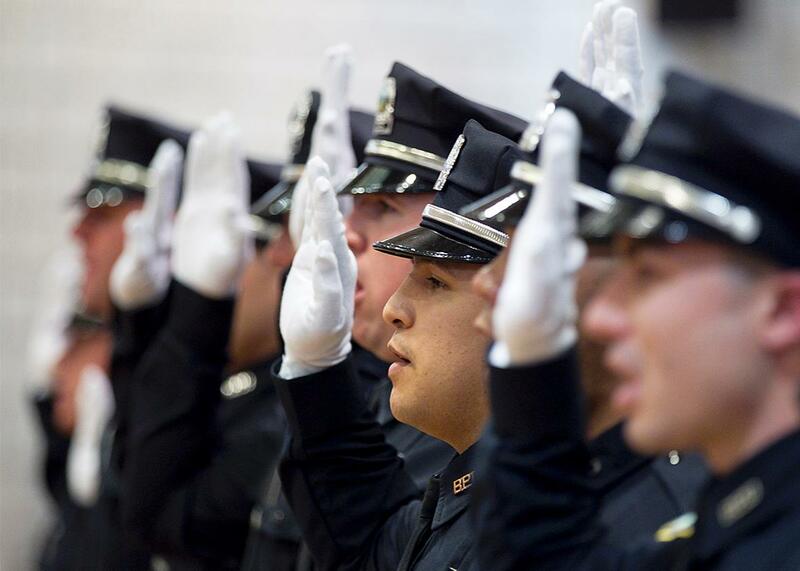 Boston Police Department Academy Graduation Class 50-11 recite the Oath of Office at Local 103, I.B.E.W. Boston in Dorchester, Mass. on Tuesday, Nov. 22, 2011. Over the past year and a half, we’ve heard many stories about police officers who shoot people, then justify their actions by explaining that they felt their lives were in danger. In Chicago, Laquan McDonald was supposed to have lunged at Jason Van Dyke while holding a knife before Van Dyke shot him in order to neutralize the threat. In Cleveland, Tamir Rice allegedly reached for his waistband, where he was supposed to have had a gun, in the second-and-a-half before Timothy Loehmann shot him. In Cincinnati, Sam DuBose was accused of trying to run an officer over in his car when that officer, Ray Tensing, shot him. The justification used in all three of these fatal incidents is, in essence, I was in danger—and when in danger, police officers are trained, they need to be prepared to use lethal force. Every once in a while, though, a story comes along that proves killing someone is not the only way to respond to a threat. One such story took place in Boston this week. It was a little after midnight on Monday morning when two police officers arrived at an apartment building in East Boston. They were responding to a 911 call—someone had requested an ambulance. But when the officers went to the apartment from which the call had been placed, they found it empty, with the door left ajar. The officers went back to the first floor, where a security guard told them that the man they were looking for had just come downstairs and threatened him with a knife before running back up to his floor. The officers followed. Moments later, they located their suspect in the hallway outside his apartment, where he stood holding a large kitchen knife in his hand. According to an account provided by the Boston Police Department (from which all the details in this post are drawn), the officers then took out their guns and ordered the man to drop his knife while backing away from him to create distance. The suspect didn’t listen. Instead, he screamed at the officers, “Kill me! Shoot me!” and pointed the knife in their general direction. Then he took three steps forward. The story might have ended right there. But instead of shooting at the man who was threatening them with a knife, the officers held their fire. One of them ducked into an open elevator and took cover, while the other stayed in the hall, holstering his weapon and backing away as he tried to calm the suspect down. It didn’t work. Instead of dropping the knife, the man lurched forward, charging at the officer in the hall with his weapon still in hand. The story might have ended here, too. But once again, neither of the officers shot the man. Instead, the one in the elevator took advantage of his position and sprayed the man in the face with pepper spray just as he passed the elevator dock. After that, the worst was over: The man retreated, and before long, the officers were able to convince him to put down his knife and take him into custody, after which he was transported to a hospital for medical attention and a psychiatric evaluation.